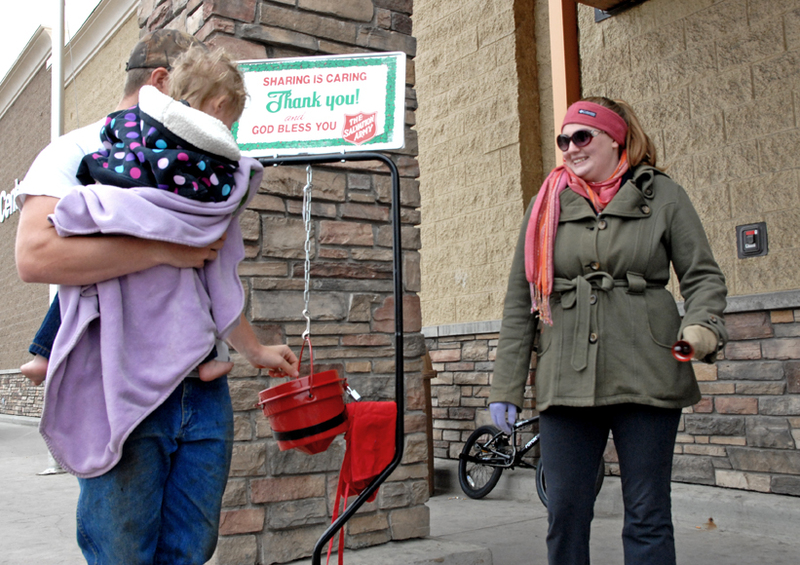 Jana Thompson, a parishioner at The Journey at First Baptist Church, volunteered Sunday for the Salvation Army Red Kettle Campaign outside of Walmart in Craig. About 90 percent of the funds raised from the Red Kettle Campaign benefit needy individuals and families in Moffat County. — Jana Thompson, parishioner at The Journey at First Baptist Church, about volunteering for the Salvation Army’s Red Kettle Campaign. Black Friday may be synonymous with the start of the holiday shopping rush, but it also marks the beginning of one of the largest fundraising campaigns in the country. Armed with Christmas bells, volunteers across the United States rang in the Christmas season Friday, signaling the start of the Salvation Army Red Kettle Campaign. The fundraiser is organized locally by the Salvation Army’s Service Extension Unit in Moffat County and runs on weekends from the day after Thanksgiving through Christmas Eve. On Sunday, Anna Thompson and her daughter Jana, parishioners at The Journey at First Baptist Church, were in the midst of their second two-hour shift of the season outside Walmart in Craig. Funds collected during the drive are distributed throughout the year to Moffat County residents in need of assistance with housing, utility, transportation and medical costs. In 2012, nearly $10,000 has been given to local families in need, according to a Moffat County SEU news release. The 10 percent that doesn’t remain in Moffat County is contributed to an emergency fund to benefit natural disaster victims in Colorado. The Moffat County SEU is recruiting volunteers for this year’s Kettle Drive. Shifts are available for families, groups and individuals. Volunteers must be 18 or older unless accompanied by an adult. For more information, call LuAnn Kline at The Journey at 824-5926.